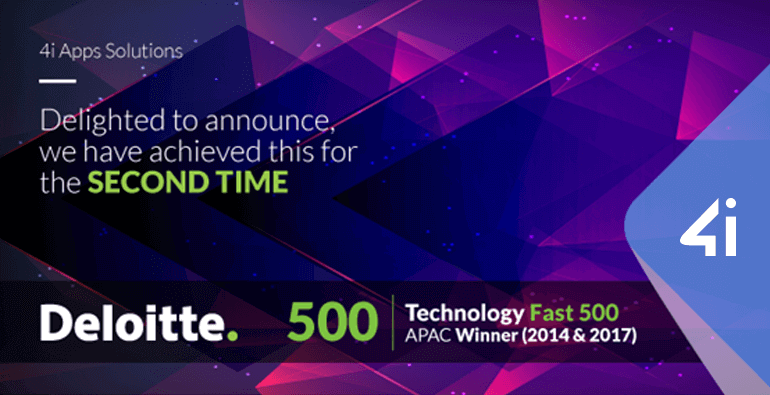 India, December 7 2017,4i Solutions announced that it ranked Number 495 on the Deloitte Technology Fast 500™ Asia Pacific 2017, a ranking of the 500 fastest growing technology companies in Asia Pacific. Rankings are based on percentage revenue growth over three years. 4i Solutions grew 76% percent during this period. Overall, companies that ranked on the Deloitte Technology Fast 500™ Asia Pacific 2017 programs had an average growth rate of 600 percent—the highest average growth rate since 2008. Combining technological innovation, entrepreneurship, and rapid growthand also awardees are selected for the Technology Fast 500 ranking based on percentage fiscal year revenue growth over three years. Based on the official published annual revenue score 4i have achieved Deloitte Technology Fast 500 APAC (2014-2017) for the second time.